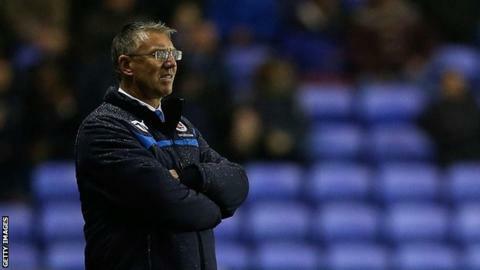 Reading boss Nigel Adkins insists he has not felt under any pressure despite a recent downturn in his side's form. Tuesday's 3-0 win over Rotherham only their second victory in nine matches, which followed a four-game winning run. When asked if he had felt pressure, Adkins said: "No. The only thing I look at is whether we can go and win. "We work very hard, we prepare and do all we can to help the football club win games of football - that's the important thing." He told BBC Radio Berkshire: "You keep doing the basics well on a consistent basis, you give the players as much information as you can to get prepared and the players have then got to go and do it. "Then we analyse it, learn the lessons and move on and get ready for the next one." Reading were in the Championship play-off places in mid-September, but a run, which has included five losses, has seen them fall to 13th in the table. Adkins' side are just six points off both the play-offs and relegation zone, but the former Southampton and Scunthorpe boss is unconcerned by the current situation. "You look at the league table, you can have a good week and it pushes you up, you have a bad week, it pushes you down, it's so close," he added. "And it's about holding your nerve, believing in what you're doing is the right thing and working very hard. "Eventually, football is about results and there's always going to be change somewhere, but you can't think about that."